Testimonials - Luce Puppet Co. The Skirball strives to provide our visitors with unique experiences they can only find here. Your performance helped contribute to our goal. You have a way of presenting puppet theatre so that the performance appeals to all ages. Your piece had the audience captivated and wanting more. I felt it was beautiful presented and took me back to the days of my childhood. For some reviews, I really wish I had 6th Yelp star to give award. Without hesitation, I would give it to Elizabeth of Luce Puppet Company! We booked Luce Puppet Co. to perform for our daughter’s 2nd birthday at our home. Elizabeth cautioned us that sometimes 2 years old and under can potentially be a little young (bravo for honesty!) for paying attention, but, I am sooo delighted we stuck with it and booked. Granted, the ages of the children ranged from about 1.5 years old to about 10. Everyone LOVED it!!! Loved is really an understatement. From the moment the cute music started, the kids began laughing hysterically. The entire show lasted around 45 mins or so (Elizabeth says she reads the crowd to determine how long it should go), but, for those 45 mins, the kids were absolutely obsessed with it. Elizabeth performed “The Splashy Sea Saga” show, which was perfectly age appropriate for everyone there. Even the adults thoroughly enjoyed it. But, seeing smiles from ear to ear on all the kids’ faces from start to finish of the show was absolutely priceless. After the show, there was time for Elizabeth to interact with the kids to talk to them and demonstrate how the puppets work. The kids absolutely loved this opportunity! Luce Puppet Co. was the key to making our daughter’s birthday a huge hit. The humor, creativity, and imagination of the show made will be sure to make a positive lasting impact on all the children there. We can’t wait to see another show! Elizabeth is one of the most creative presenters I’ve had an opportunity to work with during my ten years as Public Programming Coordinator for the King County Library System. I first met Elizabeth through her beautifully crafted puppets that she designed for a puppeteer we employed regularly. With each new show that was developed, all the staff was delighted with the quality and innovation of the puppets and the way they contributed to the story. When it was determined that the library system would create a televised puppet show to focus on Early Literacy, the first person we contacted was Elizabeth. She worked with a committee to create our “spokespuppets” – Dewey and Sketch. They are now beloved characters to children throughout the system. Elizabeth was a valuable asset to the filming of the “Dewey and Sketch” puppet shows, shown on Comcast television, and the DVD’s distributed throughout the county. She was instrumental in developing full size character costumes that are used at all major events in the library system, including library openings and family nights. Creative, energetic, a perfect addition to our class project. Elizabeth was so kind and patient with our learners. The children absolutely loved her and the show! This was great entertainment for my kid’s 5th birthday party! The other children’s ages ranged from 2 to 8 years old, and all of them were enthralled and laughed through the show. The puppet show has “stage”, creating a theater atmosphere, which looks very professional and created excitement with the kids (even before the show started). The puppets in the puppet show were great (cute and cuddly), the delivery was very entertaining, and the kids were sooo excited when they received their own finger puppet at the end! Elizabeth was also a joy to be around. Not only is she talented at making her own puppets and connected well with the kids, you can tell she really takes pride in what she does, and that she really enjoys and loves being a puppeteer. I’m sure the faculty is already aware of Elizabeth Luce’s excellent qualifications and richness of experience that she brings to our students; her work in both the profession and educational setting have given her a fine reputation in many quarters here and at national conferences. I’ve observed her formal presentations as well as her work in the studio and believe she will excel in both venues in the future. I congratulate you (The Chair) and the faculty for the farsightedness to bring Elizabeth on board this summer for the institute; and hope that there are many opportunities for her to join our department in similar activities in the future. My friends and I came to the library to see Elizabeth’s fabulous and charming show. We were treated to the spectacle of her wonderful staging methods, and theatrical puppetry expertise, and post-performance talk. I was impressed by her set up backstage. We loved watching the children too; their laughter and squealing. Their responses to the fun stuff were delightful to witness for us and must be a particularly rewarding sound for Elizabeth as the performer. 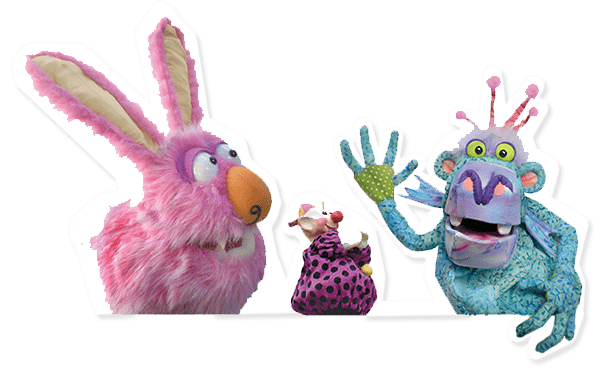 Elizabeth puts on a riotously funny puppet show that grabs the kids’ attention from the introduction and keeps them actively glued to their seats through to the finish. The subject matter is very child and family appropriate. Even adults were drawn from other parts of the library to see what was making the kids have so much fun. A very entertaining show. Amazing show for girl’s 5th birthday – 2 thumbs up!! Elizabeth made our daughter’s birthday a memorable event. Kids aged 3-15 were thoroughly engaged. So were their parents and grand parents. She is highly professional. Drove down to San Diego from LA, and setup well in time. She brought the puppets out for the kids and interacted with them. They had a wonderful time for over 45 minutes. One of the girls announced that she would perform a puppet show at her brother’s upcoming birthday! Highly recommend her show (we chose Sailor Sam’s Sea Saga) as well as Elizabeth as a talented entertainer with a great rapport with kids. We had Luce Puppet Company perform for a birthday party for an 8 yr. old…and it was great! All the kids were very entertained and engaged the whole time, which is a feat if you’ve ever hosted a birthday party for 12 kids. The puppeteer showed up promptly and set up her stage quickly (another bonus! ), which was all packed into a rolling case. She performed “Splashy Sea Saga” about a couple of silly sailors looking for treasure. Even the adults thought the show was funny! Everyone especially loved the “Meet the Puppets” afterward–lots of fun photo ops for our photo album and Facebook. The price was just right, too! We highly recommend to anyone who’s looking for a unique party entertainer for kids. My 6-year-old daughter and I caught a Luce Puppet Company show at the Burbank library recently and we loved it! Very entertaining, interactive with the kids, and the puppets are really beautifully crafted. I picked up a flyer on the way out and found out they also do birthday parties! The puppeteer, Elizabeth, was very lovely and so great with the kids. The show we saw, Splashy Sea Saga, was perfect for my daughter’s age. I would definitely consider hiring her for a birthday party, and I will be on the lookout to see her perform publicly again as well!